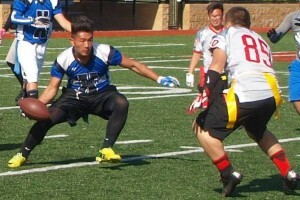 Jerry Yang, in blue with the ball, attempts to evade defense on a run down field during the Hmong flag football tournament. MINNEAPOLIS (May 12, 2015) — Minneapolis’ Farview Park hosted its 2nd annual Hmong flag football tournament on Saturday, drawing eight teams and around 300 people to the tournament. The North Minneapolis park field was improved with new football field turf for high school games in 2014. Farview staff also wanted to increase diversify among the park users and worked with several North Minneapolis Hmong football teams to officially open the field with the first Hmong flag football tournament last year. Players had so much fun they turned it into an annual event. This year the tournament was even bigger, with 8 teams and over 200 players. 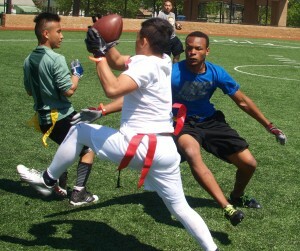 Action during the Hmong flag football tournament. Termination X and Do or Die were the home teams from Minneapolis: FSU, Chosen Disciples, Explosive, and We Dem Boyz came from Saint Paul: Avengers came from Brooklyn Park: and Warriors came from Blaine. The Farview flag football tournament was geared towards high school aged players. Many people working with Minneapolis’ Hmong community came out to cheer on the players. Minneapolis Police Department’s Hmong outreach officers, Blake Moua and Kou Vang, walked the spaces between the games, shaking players hands and yelling words of encouragement. Many of the football players had campaigned to get Hmong officers in North Minneapolis. Fourth precinct police inspector Michael Friestleben and Minneapolis parks police Sergeant James Huber also stopped by to cheer the players on. When they were not in action, players and fans enjoyed a cookout of hotdogs, Hmong eggrolls, and chips. The Hmong football players quickly proved that this was not your grandmother’s genteel flag football tournament. For six hours the players weaved and swerved, crashed into each other, and threw spectacular passes. The two Minneapolis teams made it to the finals. Termination X had won three big games, and came into the finals undefeated. But it was Do or Die who scored first, and never looked back. 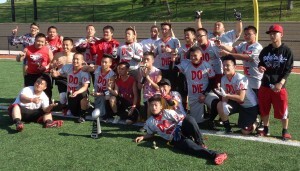 Do or Die won 30-0, taking the tournament and the trophy. Many players suggested that the tournament be made an annual event. Farview staff said they were ready to continue supporting the flag footballers. 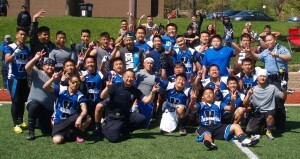 Minneapolis Do or Die, winners 2015 Farview Park Hmong flag football tournament. Congratulations.